This entry was posted in General, Publications and tagged fire safety journal on August 1, 2016 by Chris. But what has all this got to do with the only bit of French I can remember—Plus ça change, plus c’est la même chose (the more it changes, the more it stays the same)? Well, I’ve been putting together a proposal for a conference paper recently, and the particular conference I’m hoping to present at celebrates its twentieth year this year. To mark this, the organisers are asking presenters to review the state of the field twenty years ago and relate their presentation to this. Community fire safety as a concept was in its infancy twenty years ago and the Home Secretary, who was responsible for Fire Services in those days, put together a task force to look at it. They published their report, Safe as Houses1, in 1997, and I dug it out to have a look at the other day. This entry was posted in General on April 22, 2016 by Chris. 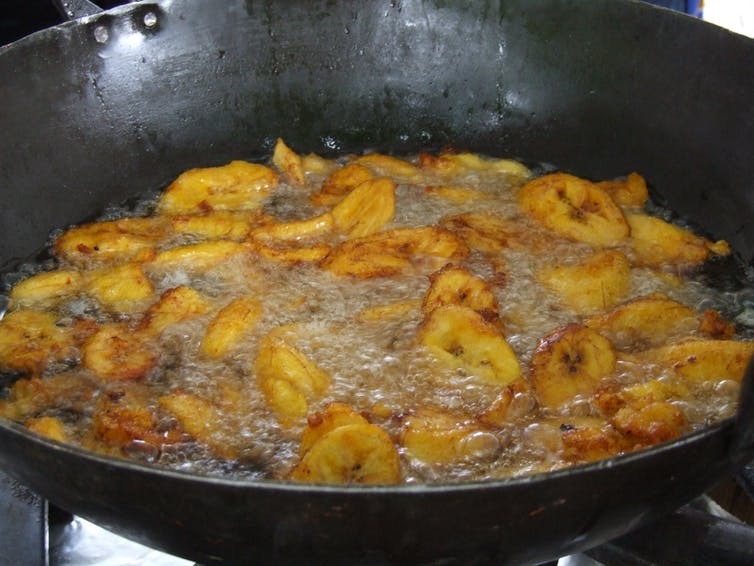 Not everyone is at equal risk of suffering loss from fire. There is considerable evidence that those from poorer socio-economic backgrounds are disproportionately likely to experience accidental fire (see Jennings 20131 for a recent summary). 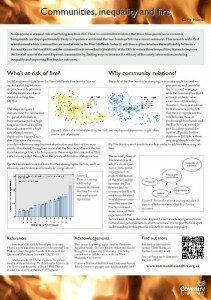 This research seeks first to understand which communities are most at risk in the West Midlands today. It will then explore whether the relationship between a Fire and Rescue Service (FRS) and the communities it serves limits the ability of the FRS to reduce those inequalities. It aims to improve the lives of some of the most deprived communities by finding ways to increase the efficacy of fire safety interventions, reducing inequality and improving Fire Service outcomes. 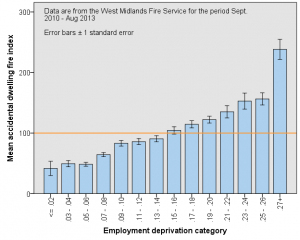 Initial analysis of data from the West Midlands Fire Service has revealed a striking relationship between deprivation and the incidence of accidental dwelling fires (ADFs). The maps in figure 1 demonstrate the similarities in spatial distribution between areas with a high rate of accidental dwelling fire and areas with a high rate of employment deprivation. 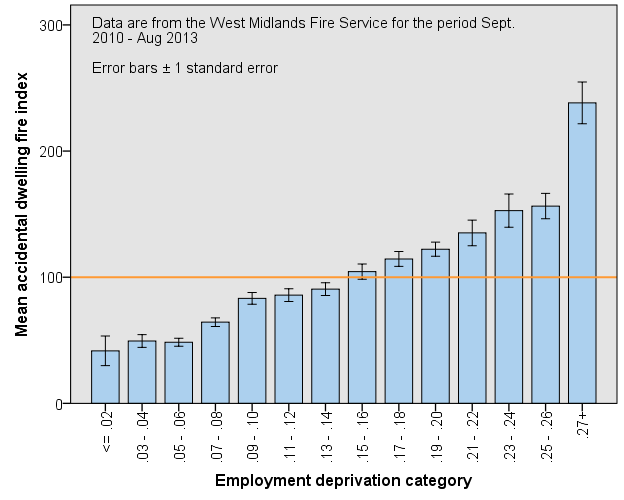 Figure 2 further illustrates the strong correlation between employment deprivation and fire—if fire were evenly distributed throughout society all the bars would reach the horizontal orange line, which represents the average fire rate index. This pattern is repeated throughout the principal domains of deprivation. Further work will look for links to other demographic factors, such as ethnicity, age, tenure and household composition. The role of the Fire Service is changing. It is increasingly focused on prevention, and central to this is a need to engage with the communities that it serves in order to raise awareness of fire safety. However, there is evidence from elsewhere in the UK that there is significant friction between those in poorer neighbourhoods and the Fire Service, rooted in part in a deep-seated distrust of all public bodies2. It is those very neighbourhoods that the Fire Service most needs to reach in order to address these inequalities. The second phase of this research will adopt a more qualitative, interpretative approach to explore the nature of the relationship between the Fire Service and its communities. It will seek to understand how different communities view the Fire Service and make sense of their experience of the Service and of the wider state. 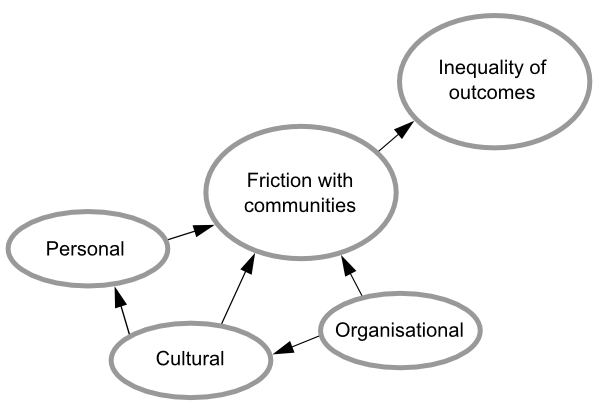 Figure 3 illustrates how organisational, cultural and personal factors affect outcomes. It is hoped that a deeper understanding of this process will help to reduce inequality. This entry was posted in General on April 3, 2014 by Chris. And on the face of it it all seems to make sense. In the context of fire, Merseyside Fire and Rescue Service has been doing interesting ‘joined-up’ work recently sharing data with a variety of other agencies to help identify, at an individual level, who is most at risk of fire1. This enables them to target fire safety interventions very precisely, which will surely mean better outcomes for less effort and cost. As I’ve been reading around the subject of community relationships with public bodies, however, I’ve started to uncover bits of evidence to suggest that joined up working may not be entirely good for outcomes. It’s all to do with trust. Some really interesting research in Bristol has suggested that actually some communities, and particularly poorer communities, distrust the fire service2. This distrust hampers the ability of the fire service to communicate the fire safety message and may be reducing the uptake of fire safety measures. And the suspicion is that it may in part be down to the fire service being associated in people’s minds with other public services. 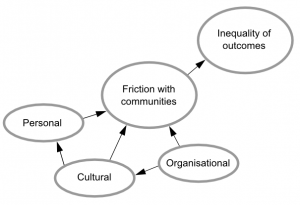 The notion is explored in more depth in some earlier research into poor uptake of community health initiatives amongst those in more deprived communities3. The researchers in this study found strong evidence that people in poorer communities were reticent to engage with public services for a whole host of reasons. These included fear of loosing resources such as benefits, feeling they were being watched or judged, and poor experiences in the past, both of being treated without respect and of simply not getting the help they felt they needed. And crucially for the work being done by Merseyside Fire and Rescue Service, data sharing between agencies was identified as a significant factor leading to fear and distrust of the public services. This seemed to be particularly acute where Social Services were concerned, with the fear of having children taken into care widespread. Few would argue that protecting children isn’t important, but perhaps that purpose is not best served by an approach which is perceived as turning all public sector workers into spies, leaving parents afraid to engage with primary health care services. This entry was posted in General on April 2, 2014 by Chris.